Let me know if you are interested in having me speak to your senior university administration team about Lean management as it applies to higher education – for administrative processes, academic processes, or both. I can do a free 90 minute meeting via Skype. This offer is only for non-profit institutions of higher education. Prior to our meeting online, there is a reading assignment and a homework assignment (i.e. flipped classroom). 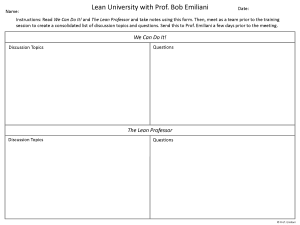 Each participant must read both We Can Do It and The Lean Professor and take notes using the fillable .pdf form at right (right click to save, use as many pages as needed). Then, meet as a team prior to our meeting to discuss what you read and create a consolidated list of discussion topics and questions, again using the form at right. Send this to me a few days before our meeting. Contact me if you are interested so we can work out the remaining details. Just letting you know that at Maharishi Univ. of Management, we have gone through lean facilitator training through Winona State Univ. for 40 faculty and staff about 2 years ago. Then, this past October, I and a Six Sigma Black Belt provided another round of training in kaizen methods to 35 additional administrative staff. Prior to the event, our Lean Steering Committee helped the departments select a manageable project as a case study to apply the principles of kaizen. Several of the projects went extremely well. In our business administration department, we had one of our staff members take the lead facilitation role and the results were quite satisfying to the process owner. We are currently writing up the case for publication. Just wanted you to know that I can be a resource in case you need another facilitator for a project in higher education administration. We at Berea College are interested in your offer. Please contact me to discuss the next steps.